Tag Archives for " hair styling "
It’s the age-old question: How often should you wash your hair, really? Back in the day, we wouldn’t dream of going a whole 24 hours without some shampoo, but then we started hearing that it is bad to wash your hair every day—and there are even people out there who can make their blow-out last a whole week. So what’s the deal? We’ve always known we need to wash our hair regularly, but it’s so hard to decipher what “regularly” actually means. We consulted hair experts for the ultimate hair washing intel. Is there a good rule of thumb for the magic number of days you can go without washing your hair? Really, it depends on your hair type. Hair that’s thicker and curlier can go without a wash for longer than hair that is fine. How processed your hair is will also come into play, because the oils in your scalp don’t travel down the hair shaft as quickly in hair that’s coarse, curly or processed as it does for gals with fine hair, says Marlene Montanez of Latest-Hairstyles.com. For this reason, curly hair types should especially be careful not to wash hair too frequently—and avoid shampoos with harsh sulfates, which strip the hair of the natural oils. You can consider a co-wash (using a conditioner instead of shampoo) or use a sulfate-free shampoo if washing more than twice a week, says Jane Nyachiro of hair brand Jirano. Lifestyle also plays a part. For example, if you workout daily, you’re going to need to wash your hair more often to feel clean after sweating. If you have an oily scalp and thin, fine hair, your hair will start to look flat and dirty after 24 hours. If your hair is pin straight, an oily scalp will show more easily too. The flip side is with thick, curly hair, you may be able to go three days without needing a shampoo. It’s pretty simple: Washing hair every day removes our natural oils and proteins, causing our hair to dry out quicker. Shampoo strips the oils from the hair, and we need those oils to help our scalp and hair to be healthy, says Emily Woodstrom of HAIRitage ‘Hous outside St. Paul, Minnesota. Some people shampoo so frequently and strip the natural oil in their hair so much that it becomes very frizzy—and there day-after hair actually looks better when oil has accumulated on the scalp to tame these wild hair shafts, says Dr. Scott Rackett, a dermatologist and hair care expert. Often we apply product to calm the hair, when really just shampooing less frequently would improve the look of the hair and lessen the need for hair products. The trick is to find a shampoo, conditioner, and a cocktail of products that balances your scalp and hair so you can wash every third or fifth day. “If one has hair on the finer side I’ll recommend a volumizing shampoo so the remains light and won’t get greasy too fast. Transversely, if a client comes to me with course, dry, thick hair I’ll recommend something that will moisturize and balance the scalp and hair. It’s a bit of a trial and error thing. At most, try washing your hair every other day. Every two days is even better and if you can make it an entire week, go for it! If your hair gets oily after only a day, try using some hair powder or dry shampoo on your roots to soak up some of that excess oil. There are also tons of products on the market for in-between wash days that will help your hair get some extra lift and smell fresh. After the gym, try spritzing a refreshing mist or do a rinse sans shampoo. If you must wash and shampoo each time after a workout, try a shampoo that’s made for daily cleansing—they’re usually less harsh on your hair. Originally published October 2014. Updated March 2017. Maybe you ditched conventional haircare products years ago, or maybe you’re exploring more natural options. Whatever the case may be, essential oils for hair can be an integral part of everyone’s natural routine. 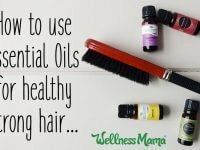 Over the years I’ve found some favorite essential oils proven to strengthen and improve my hair, and they smell great too! I’ve always been careful to use essential oils safely and not ingest them unless suggested by a healthcare provider, but I love using them topically. 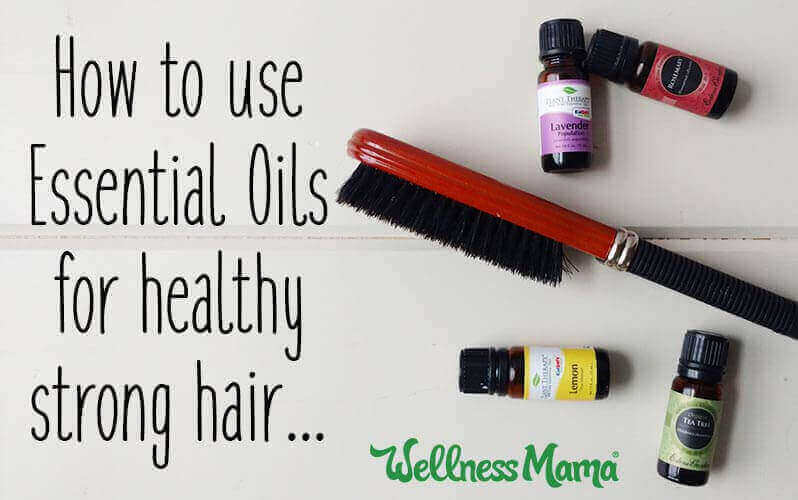 Using them in my hair is one more way to get the benefits of essential oils safely. A caution along these lines: Always dilute essential oils in the appropriate ratio in a carrier oil (or a beauty product containing oils) as essential oils do not dilute in water. The resources section in this episode of the Healthy Moms podcast gives several helpful charts as a guide. Remember, it isn’t good to put straight essential oil directly on the hair or scalp, ever. 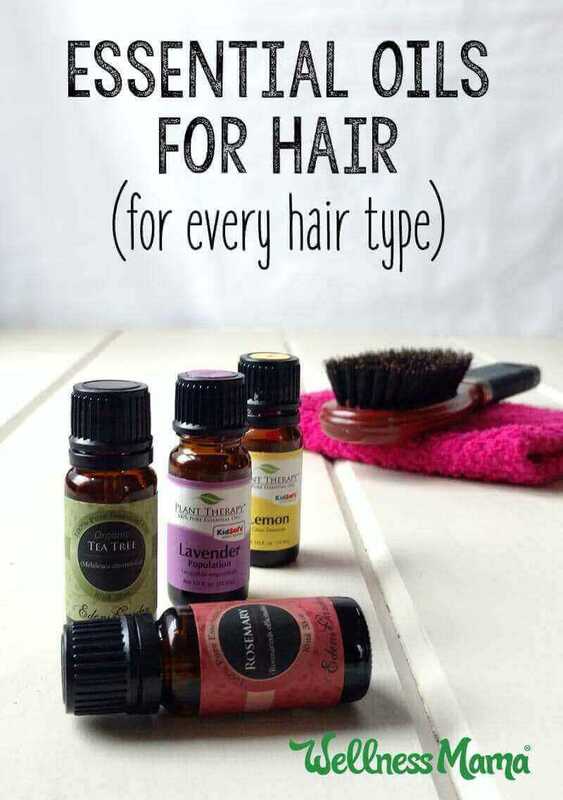 That being said, here are a few of my favorite essential oils for hair! This floral essential oil (I like this one) has aphrodisiac properties and a strong, distinct odor. It may be too overwhelming to use on its own, but it combines well with other essential oils for hair, like lavender and even lemon. People have been using ylang ylang to help grow their hair for a long time, as it was a popular hair growth remedy in Victorian England. This essential oil works by stimulating hair growth to treat thinning hair and also stimulates production of our scalp’s natural sebum to nourish dry, damaged hair. Ylang ylang also offers aromatherapy benefits, as it works to relieve stress in the body. Since stress can sometimes cause hair loss, using ylang ylang is a great way to kill two birds with one stone. And for little ones who are frequently around other children, ylang ylang can also help to repel lice. Tea tree is one of the most popular essential oils for soothing damaged skin, but it’s also great for scalp health. Since this essential oil is antifungal, it’s been successfully used to treat dandruff. In this study, there was a 41% improvement in the severity of the dandruff as well as in the symptoms of itchiness and greasiness. Tea trea was also shown in this 2013 study to slow hair loss and increase hair growth and appearance, without the itching and inflammation that the control group had. And like ylang ylang, tea tree oil also treats head lice. Lavender is another favorite essential oil for skin that doubles for hair care. This study found that lavender increased the number of hair follicles for a thicker head of hair. The hair follicles in the lavender group were also deeper, meaning stronger roots for less hair falling out. Lavender essential oil also showed significant help in hair growth in this study that used a combination of several different essential oils, all with no significant side effects. Many guys like cedarwood essential oil because of its woody, more masculine scent. So if the man in your life objects to using more feminine-smelling oils like lavender and ylang ylang, then cedarwood may be a good option. It stimulates the hair follicles and increases circulation to the scalp to combat thinning hair. Cedarwood has also been helpful at improving dandruff symptoms. Rosemary works well for dandruff due to its ability to minimize scalp itchiness and flakes. It helps to treat both dry, dull hair as well as overly oily hair and can help prevent split ends. In this study, rosemary essential oil was found to be just as effective against balding as the conventional treatment when it was used for at least six months. It helps to prevent premature baldness and stimulates the hair follicles. As a citrus oil, lemon helps simulate circulation in the scalp for increased hair growth. It’s also helpful to reduce overly greasy hair. Since there is some concern for phototoxicity here, don’t slather your head in lemon essential oil and then go sunbathing. Use lemon at night (or at least twelve hours before sun exposure), or don’t use more than a 2% concentration. However, if you’re using a few drops in your shampoo then washing it out of your hair, there’s no concern for phototoxicity. I like this organic one. Juniper berry has a fruity scent to it and blends well with both lemon and cedarwood essential oils. It’s helpful for overly oily hair and helps strengthen brittle strands. Juniper berry’s antiseptic properties help fight scalp conditions, and its astringent properties tone hair follicles to prevent hair loss. Lemongrass has potent antiviral and antifungal properties that make it useful for a variety of scalp issues. In this study, several hair tonics were compared, and the one with a 10% dilution of lemongrass had the best results against inhibiting dandruff caused by yeast. Add a few drops to your shampoo or conditioner and lather as usual. In all of the studies, results were seen after consistent use for at least six months. Most of the treatments were used daily until results were achieved. You can do a scalp massage with essential oils for hair diluted in a carrier oil to help reduce the symptoms of dandruff, psoriasis, or stimulate the scalp for hair growth. Part the hair and apply the oil treatment to the scalp in sections. Take your fingers and press them firmly onto the scalp, moving the skin across the skull. Do not however allow your fingers to move across the scalp. Allow the oil treatment to stay on for at least an hour before rinsing/washing out. Do you use essential oils in your natural hair care routine? Is it something you can see yourself trying?